The first Sunday of September is an important day for Venetians. In fact, it’s the day where the real soul of Venice comes out of the water again through the Historical Regatta. The Historical Regatta, Regata Storica in Italian, is a very heartfelt event and every year many people from all over the world come to see this incredible boat parade and the race. Literally, a regatta is a series of boat races. Venetians coined the term “regatta” back in centuries when a city on the water like this had to train its gondoliers and rowers. But this wasn’t the only reason. Regattas were also an excuse to have a party in town, to celebrate special events or the visit of an important person. Usually they were financed by noble Venetian families or famous foreign people. Even if the first mention about regattas was in the 13th century, it’s likely that they were born in Venice before that time. As we said, a parade of historical boats, carrying people wearing traditional Venetian costumes, precedes the races. The Bucintoro, the Doge’s ship followed by the boats of the Venetian rowing clubs, goes through the Grand Canal, remembering the day when Caterina Cornaro, Queen of Cipro, came back to Venice. It’s 4 pm and this is just the beginning. Right after the magnificent parade, at 4.30pm starts the first race: the Maciarele and Schie regatta, a two-oared regatta on mascarete dedicated to children. 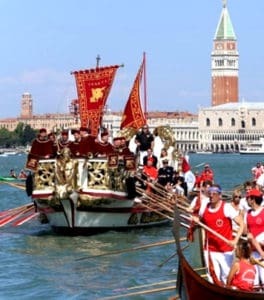 Afterward, it will be the turn of the young rowers’ twin-oared pupparini regatta, starting in St. Mark’s basin and ending in front of Ca’ Foscari, where the so-called “machina” (a floating platform hosting people like the mayor) is located every year. At 5.10 pm will be the time for the six-oared caorline regatta and at 5.40 pm the Women’s twin-oared mascarete regatta. Last but not least, at 6.10 pm there’ll be the final race: the Twin-oared gondolini regatta, from St. Mark’s Bay to Grand Canal, Rialto (around the paleto in front of San Marcuola), and back down to the Grand Canal to finish at Ca’ Foscari. If you want to find a good place where to watch the historical Regatta in Venice, you have to know the exact route the rowers are going to do. All the races are starting from St. Mark’s Bay and the most important ones end in front of the beautiful Ca’ Foscari palace. The first place we suggest you for watching the Historical Regatta is certainly Rialto, since it’s halfway and easy to reach from our hotel. But, it’ll be probably crowded on that day, more than usual, that’s why we want to tell you some secret places where to go alternately. Of course, you can decide to buy a ticket to watch the Historical Regatta sitting on the “machina” which costs around 60 euros per person, but there’s a lot of places where you can watch it for free. This place is not really easy to find without a GPS, but it’s worth it. In Calle del Tragheto de la Madoneta, there’s a private jetty that you probably won’t be able to use, but you can still stand on the “fondamenta”, and enjoy the regatta from there. At San Silvestro, there’s an ample space where to stay and watch the regatta, right next to the vaporetto stop. Be there in advance, since it’s a place people know well because of the vaporetto stop and it can be crowded. Right on the other side of the Grand Canal, there’s Riva del Carbon, a long “fondamenta” where you can see the boats speed to the arrival point at Ca’ Foscari. San Tomà is the closest place to the arrival. Here at the vaporetto stop, you can try to win some space among people and see the last rows that separate the rowers from the cup! It’s going to be epic, as always, and watching the Historical Regatta in Venice will be an emotion that you can’t even imagine. For Venetians, this is a significant event, a way to remember how big Venice was during the Serenissima Republic and never forget the story of the city we come from. So, now that you’ve all the information to find the best place to watch the Historical Regatta in Venice are you ready for the show?